Classical CD of works by Sarasate, Tartini, Ravel, Massenet, Faure and Wieniawski. Featuring Mutter on violin with the Vienna Philharmonic conducted by James Levine. Deutsche Grammophon/4D Audio, 1993. Digital Recording. Full silver. No IFPI code. Stated 'Made in France by PMDC'. Catalogue number: 437 544-2. Includes booklet. Classical CD of Sarasate CARMEN-FANTASIE and Tartini: Devil's Trill; Ravel: Tzigane; Massenet: Meditation and works by Faure and Wieniawski. 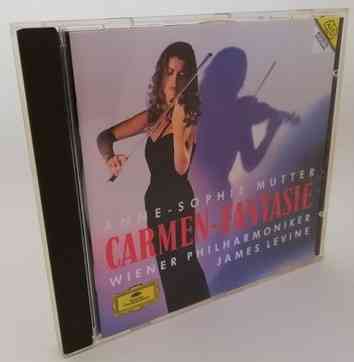 Featuring Anne-Sophie Mutter on violin with the Vienna Philharmonic conducted by James Levine. 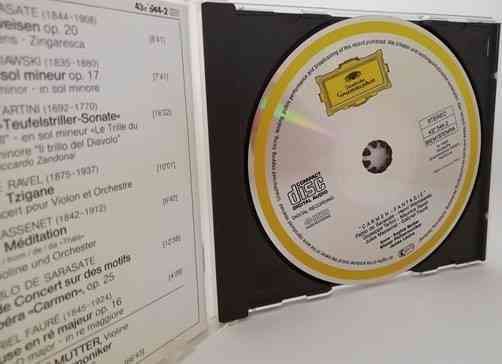 It was issued by Deutsche Grammophon/4D Audio in 1993. Digital Recording. Full silver. No IFPI code. Stated 'Made in France by PMDC' on the CD. Catalogue number: 437 544-2. Includes booklet. The CD itself is in excellent, unblemished condition and plays through with no issues. The jewel case is also in excellent condition but has a barely feelable 3cm-long crack at the back but is otherwise intact and sturdy. The booklet is also in very good order with the only significant blemish being two small indentations to the open edges where it has been resting against the closed case.